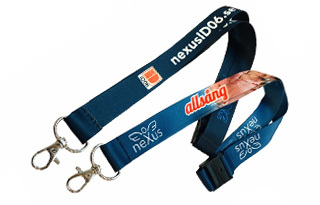 You can easily add different types of cards, key fobs and accessories in the order portal, for example lanyards, card holders and our latest product, Key fob Ultra! Key fob Ultra has a new, exclusive design. 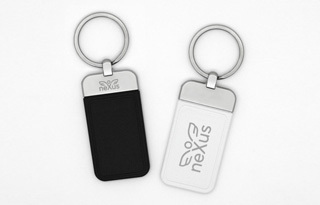 You can laser-engrave your company logo or symbol at both side of the key fob. The attachment and the ring are made of stainless steel which can also be laser-engraved, Key fob Ultra is available in black or white, with MIFARE Classic or MIFARE DESFire. Card holders, lanyards and yo-yos! You can easily add accessories for your card or key fob in the order portal. Nexus offers a big selection of accessories in different colours and you can order everything you need at one single point. Welcome to contact us and we will add any of the products that you need! and we will support you further! To manage the entire life-cycle of your photo ID cards in a smooth, secure and cost-effective manner, you need everything from self-service stations to advanced software. A multifunctional ID card (also called a common access card, CAC) is a card that can be used for a wide range of applications, such as visual identification, computer and cloud service login, door and cabinet access, cafeteria payment, follow-me printing, digital signing, and book borrowing. RFID technology is developing at a rapid speed. At Nexus, we make sure to keep up to date and offer you the latest, best and most secure RFID chips.